Excavating and trenching are sometimes necessary when performing construction projects. A trench is an area of excavation on a construction site where the depth is larger than the width of the excavated area. Trench work can be used to install cables, wires, piping and other needed equipment below ground and under buildings. These activities have a risk of serious accidents. Risks of trenching activities include cave-ins or a trench collapse. Up to 100 workers die each year in trench collapses according to NIOS (the National Institute for Occupational Safety). OSHA (Occupational Safety & Health Administration) found that construction workers who work in excavated parts of a construction job site are twice as likely to be involved in a fatal accident when compared to workers at other parts of a construction site. In New York City, the Department of Buildings conducted approximately five thousand inspections of excavation sites finding more than three thousand violated a code, regulation, or law. One thousand of these violations were so severe as to warrant a stop work order on the construction project. To safely perform trench work and excavation, the contractor should inspect the trenching or excavation area to make sure it is safe on a regular basis at least once a day. If underground utility lines or pipes are found which performing construction, they must be handled safely and reported to the proper utility company immediately. Indications that a trench accident may occur due to a trench collapse include tension cracks, changes in the slope of a wall, bulge emanating from a wall, softening of a wall, or other clearly visible change to the trench. Contractors should inspect the soil and check for any changes in its condition. Vibration from construction machinery during work can also lead to a trench accident. In the event of a trench accident, the contractors on the site must have a safety plan in place for a means of escape and exit from the trench collapse. An escape route may include a ladder, ramps, or stairs. Working under the ground repeatedly may cause the ground to shift leading to a trench collapse. Any construction worker inside a trench during a collapse will become buried by soil, dirt, rubble, and rocks, and other debris. Heavy construction equipment and machinery may fall down or roll over onto its side as a result of a trench collapse. The shifting of the ground and construction equipment will be an immediate danger to workers in the area. An injured construction worker is entitled to worker’s compensation but may also file a third party action against the general contractor, property owner, and other responsible parties. Both the New York State Labor Law statutes as well as general negligence laws may be applicable in a trenching accident. 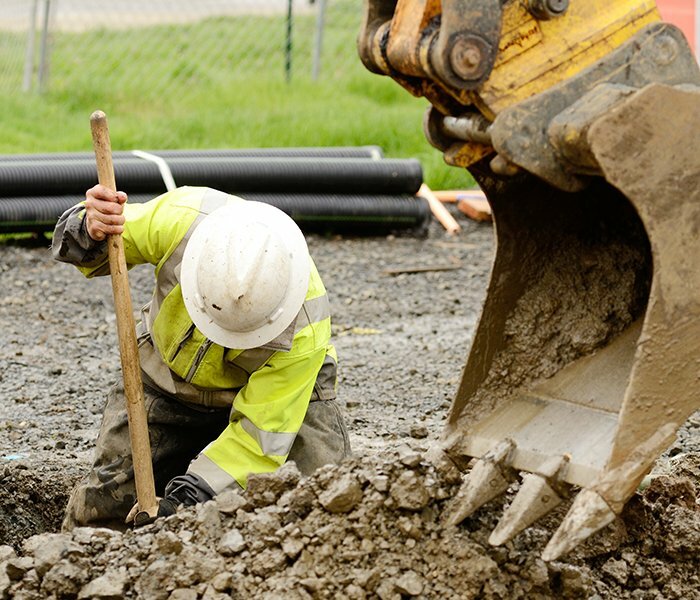 If you or a loved one was involved in a trenching accident, contact the construction accident lawyers specializing in trench accidents at the F&A Injury Law Firm at (212) 222-1111.